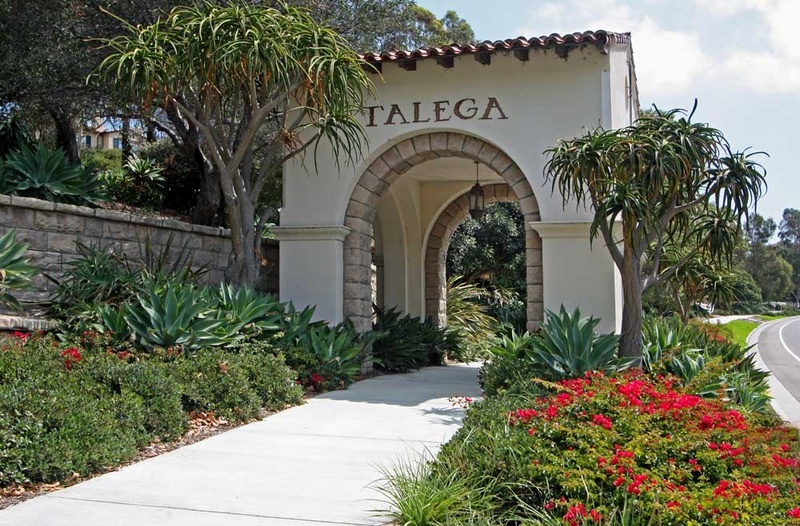 Talega is a community located in the San Clemente just a couple miles to the beach. The homes in Talega of San Clemente started construction in 2000 and soon became the place to live for incoming San Clemente home buyers. Talega is known for it's 18 hole golf course and the top schools in the area. Most of homes in Talega are single family homes built in the Spanish Colonial & Mediterranean Style Architecture. There are also condo/townhomes and well as 55 year + communities in Talgea. Talega is a planned community and consists of many great neighborhoods listed below. There are aslo great parks, numerous assocaition pools and a Swim Athletic Club. Here is a quick run down of the Talega neighborhoods. The Alora community consists of Single Family homes. The Alassio by Standard Pacific Homes consists of Townhomes typically in the $300,000 - $500,000 range. The Alta community built by Standard Pacific Homes are Single Family Homes and range from $1.3 million - $1.7 million. The Amalfi community built by Standard Pacific Homes are single family homes typically in the $550,00 - $700,000 range, The Bella Vista by Manning Homes are Single Family Homes in the $1.1 million dollar range built in the Tuscan and Spanish style. Careyes, is a gated community with large single family homes on large lots. These homes have come down in price a lot and are now selling in the $1.2 - $1.5 million dollar range. The Carillon community built by Standard Pacific Homes conists of single family homes in the $1.2 million dollar range. The Cantabria community are single family homes just under the $1 million dollar range. The Caprizi community is one of the more affordable single family home communities where prices are typically in the $600,000 range for a 4 bedroom home. The Cantabria community consists of single family homes. The Catania community was built by Standard Pacific Homes in 2005 & 2006 and prices now start around the high $700,000 range. This is a great discount from the $1.6 million dollar range just a short 3 years ago. The Cazadero community was built by Shea homes and are single family homes typically with 4-5 bedrooms and prices range from $700,000 to $1.2 million. The Coral Bay by Shea Homes community are Single Family Homes. The Escala community are single family homes that were built by Standard Pacific homes in the $600,000 price range for a 3 bedroom/3 bath home.) The Farralon Ridge community was built by Lucia by Laing Luxury Homes are Single Family homes in the $600,000 range for a 4 bedroom/3 bath home. The Mirador community was built by William Lyon Homes and are Single Family Homes in the $1 million dollar range. The Miraleste community are Single Family Homes with great panaromic views and range in the $800,00 range. The Monterey community was built by Standard Pacific Homes and are Single family homes and price ranges in the $800,000 range. The Pacifica community are larger homes with some homes offering golf course views and range from the $1.1 - $1.3 range. The Portmarin community are single family homes in the $650 - $700,000 range. The Ravenna homes are single family homes in the $1.3 million dollar range. The Sabella neighborhood was built by Pulte Homes and are single family homes in the $600,000 range. San Lucar by Brookfield homes are single family homes in the mid $650,000 to $720,000 range. Sansol by Standard Pacific Homes are nice Single family homes in the mid $700,000 range. Santalana by Standard Pacific Homes are affordable townhomes near the new Talega shopping center and range from $300,000 - $450,000. Seaside by Shea Homes are large single family homes in the $600,000 range. The Solana neighborhood are single family homes are one of the most affordable neighborhoods starting in the low $500,000 range. Stella Mare by Standard Pacific Homes are single family homes in the $900,000 range and built in the Tuscan style. Verano townhomes built by Lennar Homes range from $350,000 - $450,000. The Vittoria gated community are large single family homes in the $700,000 range and neighbor the gated community of Catania. And the Vizcaya community are very large luxury homes in Talega. These homes are currently priced in the $1.6 - $1.9 million dollar range. For a complete list of Talega communities please scroll down or use the Talega directory to your right.